been! Only too soon did I return to myself and to my existence, which is without a doubt a horrible, lost one. each other. No pole, no rope, no help far and wide. others flying into the water. Oh, I could have done it! But I close the high wall of the parapet. rustling under me in the evening wind; Over me the night birds are rising with heavy swinging wings. child, your Idilia! Do not you urge a dark train of your soul here! Marie, George! You must hear me! Hear! Hear! Your sister, your poor, desperate sister! mother, George, Marie, would you let me die so terribly, so terribly? to mine and bring them news of my misery. This is, I believe, the fourth day! Day? The Fourth Amendment to Hell! Yesterday I felt as if I was listening. before my eyes. In the sway, the underlay dissolved, and I fell with the stones to the ground. Father in heaven, be merciful to my soul. Idilia Dubb and her family were originally from Scotland. In the late spring of 1851, The Dubbs, Idilia, her mother and father and brother and sister took a trip to Germany. On their trip, they visited Lehneck Castle in the city of Lahnstein along the Rhine River. Idilia, wanting to record a view of the river, climbed the dilapidated stairs in the abandoned castle to the top of the pentagonal tower. With her sketchbook in hand, she was to start drawing the magnificent view from the castle but the wooden stairs collapsed trapping her in the tower. No one knew that she had went up there and all expected her for dinner that evening. When Idilia didn't show up, the police were notified and a search went out. Everywhere and everything was searched. The only place that wasn't was Lahneck Castle. Fearing the worst, Idilia's family hesitantly and despondently, returned to Scotland. Idilia screamed and waved at whoever she could from the tower but no one heard, no one saw, no one cared, no one came. In 1860, Lahneck Castle was finally going to undergo repairs. Workers climbed to the top of the tower and found a skeleton in tattered clothes, some pages of a sketchbook nearby. Words scrawled on the pages told the story of the final days of Idilia Dubb. Her parents were brought in from Scotland, her remains identified and taken home. 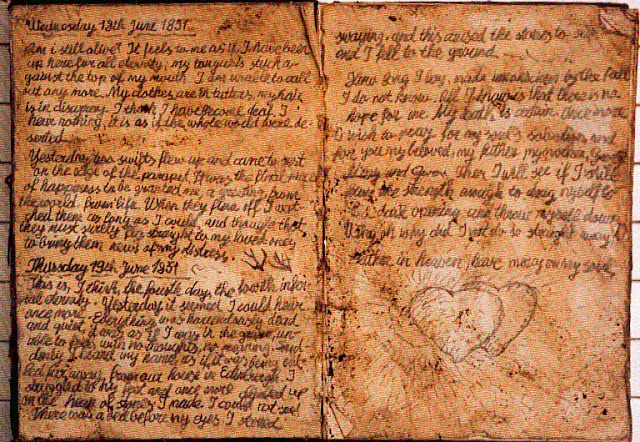 Most people agree that Idilia Dubb did not really exist, that her diary is a fraud, and that her tale of tragedy is just that: a made-up story. Researchers have been unable to find evidence of the Dubb family anywhere in Scotland and that her diary is in such good condition despite being exposed to the elements for nine years. Is the story of Idilia Dubb a complete fabrication? Is it a mix of truth and fiction? We will likely never know.